And it’s done! 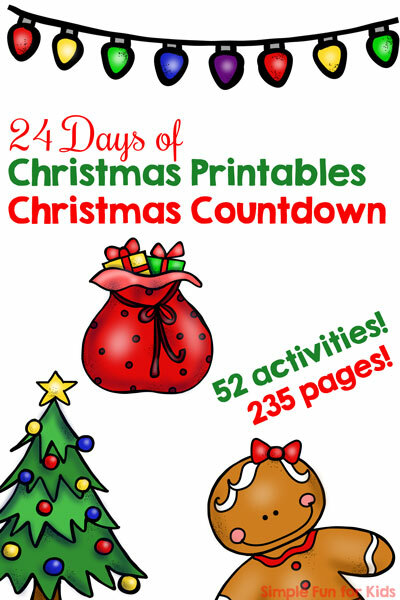 It’s Christmas Eve, and we’re finishing off the 24 Days of Christmas Printables for Toddlers series today! 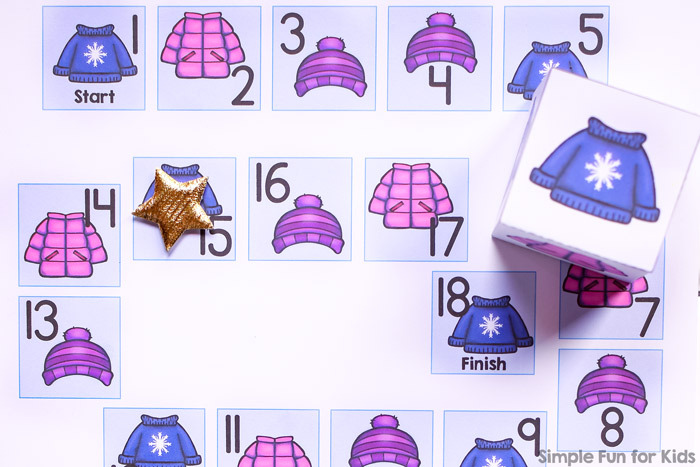 Today, I’m sharing a type of printable I’ve never done before: a super simple Winter Clothes Board Game for Toddlers! I’ve included two different versions, a really short one (that was just right for my 2.5-year-olds attention span the first time he played it) and one that’s a bit longer for older and/or more experienced players. Laminator plus laminating pouches (optional). Manipulative or something to use as a pawn. Glue stick or sticky tape. There are two versions of the game board and a custom die plus an extra sorting mat if you want to add an extra dimension to the game. One of the game boards has 10 squares, the other one has 18 squares. They both show the following winter clothing items: Blue sweater with a snowflake, pink puffy jacket, and purple striped hat. The custom die shows the same three items twice each. Print out one of the game boards and the custom die template. Cut out the die template at the solid lines and fold it at the dashed lines. Add some glue to the tabs (or use sticky tape) and put the die together. If you want to use the optional sorting mat, print that as well plus a second copy of your chosen game board. Cut out the squares on the second copy of the game board and place them on top of the squares on the intact game board. For the basic version, simply roll the die and place the pawn on the next matching image. Take turns doing this until you get to the finish line, then celebrate 🙂 We’ve played cooperatively, but you could have two pawns and make it a race. If using the sorting mat, pick up the card that’s on the square you’re about to move your pawn to and place it on the matching image on the sorting mat. 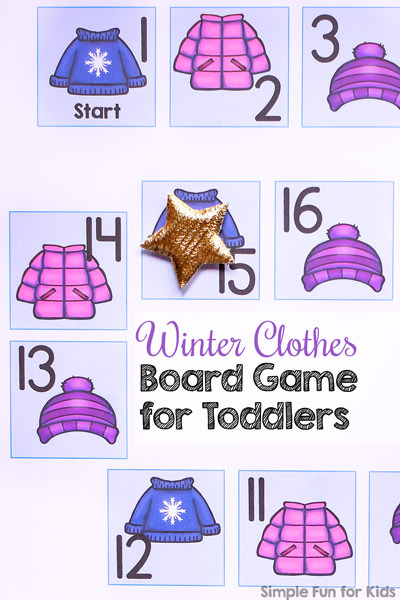 Download your Winter Clothes Board Game for Toddlers! 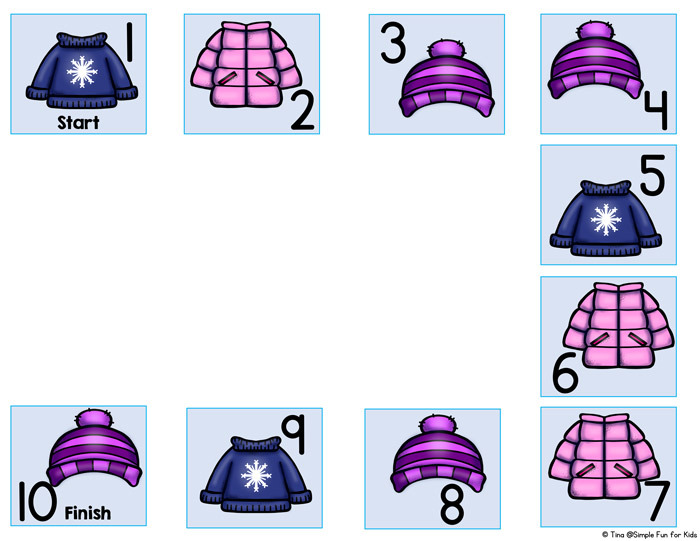 Winter Clothes I Spy Game for Toddlers and Winter Clothes Counting Clip Cards (1-20) both use the same set.